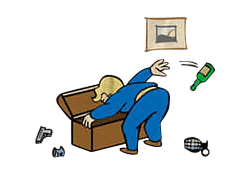 Scrounger is a Perk in Fallout 4. It is associated with the Luck Stat. Rank 1: You know just how to scavenge to keep the fight going, and find more ammunition in containers. Rank 3: You find even more ammunition in containers. Rank 4: You find even more ammunition in containers.